This weekend tragedy found its way back into our family's life as Jess had to say goodbye to two of her precious dogs. Somehow the three of them got out of the backyard on Saturday morning. Aiko, the Australian Shepherd, being the responsible old gal, immediately went to the front porch to wait for Jess to discover they were out and open the door for her. Cash and Eva, the two totally curious and playful Pit Bulls, after figuring out how to escape from the 10 foot high fence, decided to do a bit of exploring on their own..... unfortunately they found their way to the highway behind Jess' house where the traffic runs at at about 70mph.. As soon as Jess discovered they had gotten out, she began scouring the neighborhood, but with no luck. She and Jeff's mom decided they should get in the car and check the highway, but they were too late. Both dogs had been hit (and yes, someone just drove off and LEFT THEM in the middle of the road- WHAT IS WRONG WITH PEOPLE?!) and both died very soon after. Although I went through this day with Jess as we talked and texted all throughout, I cannot even fathom the grief she was and is still feeling. I lost Emmitt only a few months ago, but we were prepared for it a bit since we decided when to have him put to sleep, but to lose TWO of your precious pets at the same time and in such a terrible way must hurt in a way that none of us can understand unless we ourselves have experienced it. I had just written a blog post about what a great mom she is to those dogs. She is such a nurturer and has really raised them the right way. To have them taken from her just seems so very wrong. They buried Cash and Eva- here- in this meadow that belongs to a neighbor of theirs. Jess said it is a beautiful place--befitting those precious animals. In the course of the outpouring of love for Jess and Jeff this weekend, a friend of hers sent this to her, hoping the words would be a bit of comfort... and I thought it was just too precious not to share with anyone who sees my blog....especially those of you who love your 4-legged family members like we do. I once read a quote that stuck with me that said that a dog's only fault was that their life was too short. So true. Oh, such sad sad news. 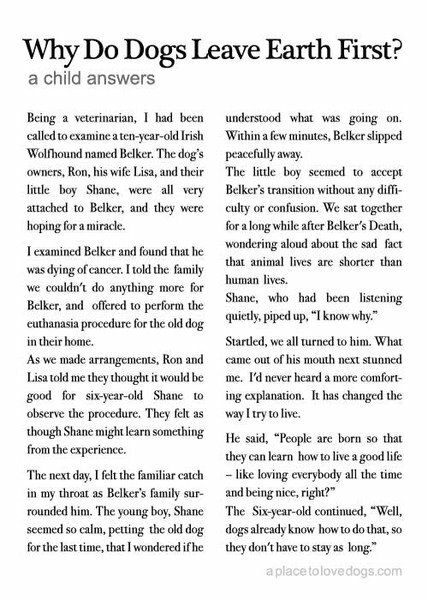 That story about the small boy and his pet is just beautiful. That is sad. I've lost dogs before,and been sad, but I'm closest to my two current dogs, and I would be DEVASTATED if one of the died unexpectedly. Eugene O-Niell once wrote a short story of the last will and testament of his Dog, Blemie. It's a good read, and may make you/her feel a little solace. Oh my gosh, poor Jess! I can't imagine losing my babies like that, so suddenly and randomly.